Rest vs rhythm: The two-time defending champ Miami Heat enters the semifinals well rested as they swept the Charlotte Bobcats last week. 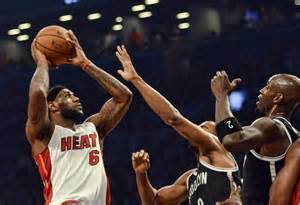 The Brooklyn Nets defeated the Toronto Raptors in game 7 yesterday and off short rest they face the Heat Tuesday. The Heat find themselves in similar predicament, last year the Heat dusted off the Milwaukee Bucks in the 1st round and waited nearly a week for their semifinal opponent Chicago Bulls conclude their 7 game series. The Heat lost the 1st game and went on to win four straight to take the series. The Heat have undoubtedly have the best trio in the league spearheaded by Lebron James. James is carrying the load while Dwayne Wade is slowly emerging from his injury woes. Can the heat overcome their issues and advance? The Nets finally reached the semifinals after last year heartbreaking Game 7 loss to the Chicago Bulls in the 1st round . The Nets re-tooled as they acquired Paul Pierce and Kevin Garnett…guys who put the fear in the Miami Heat. The Nets are a matchup headache for the Heat…this team was built to beat the heat. The Nets swept the season series (4-0) , 3 of the games were decided by a single point & the other game went to double overtime. The Nets will give the Heat its biggest test thus far. The Nets Win if: Kevin Garnett outshines Chris Bosh and Paul Pierce come through in the clutch. Next Post → The Final Couch Coach 2014 NFL Mock Draft!!!! Good post! I think the layoff helps Miami, particularly D-wade since hes not 100%. A agree that this could be a long series with the Heat winning in 6.